Melons, Melons Everywhere, But Which One Should I Eat? During the summer months, we at the Natural Grocery Company carry a wide selection of different types of organic melons. Big or small, yellow, green or white fleshed, we have it all! 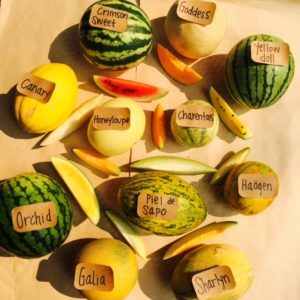 There is something for everyone here, but how does one pick the right varietal and choose the right melon? 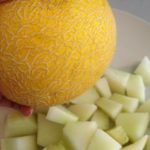 Here are a few tips and tricks that I have learned to pick the best melon. We will be getting in more varieties as the summer months progress into fall. These elongated melons are coming to us from Jeffrey Mettler Farms in Bakersfield Ca. The best way to pick a seeded watermelon (one that has black seeds inside) is to check for the wasp stings! 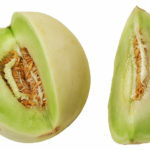 Wasps will sniff out a sweet melon and sting it to release some of the sweet nectar. Look for a line of tiny brown dots on the rind with small drops of black candy seeping out. This method has always worked for me when choosing a seeded watermelon. Watermelons, unlike cantaloupes, have to be harvested when ripe as they do not continue to ripen after being picked. Our seedless (red fleshed) watermelons are coming from Rundle Family Farms in Fresno. We also have 2 other types of watermelon coming from Full Belly Farm in Guinda Ca. The other types are “Orchid”, which has a mild, sweet orange flesh, and “Yellow Doll” which has a sweet, slightly stronger flavor and the flesh is yellow in color. 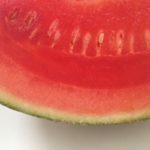 When picking a seedless watermelon, there are many different things to look for. 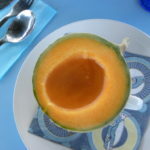 These tips can be applied to other types of melon as well. First, pick a dull looking melon. A shiny appearance indicates an under ripe melon. (This also applies to Green Honeydew.) Second, find the field spot. This is the creamy spot on the rind of the melon where it has rested on the ground. This spot should be yellow, not white. The darker and bigger the spot, the longer it was on the vine sweetening up. If the spot is white or nonexistent, put it back as this will be an under ripe melon. Third, knock on it! A dull thud indicates an over ripe melon. You will get a dull thud if the flesh is soft, which you don’t want. Your knuckles should bounce off of the melon and the surface should be pretty hard-firm. Next, pick it up! The melon should feel heavy for its size. Compare it to other equally sized melons. Last, check the shape! Irregular bumps indicate it may have gotten inconsistent amounts of sun or water. These melons will usually have a big crack in the flesh inside. We have both green and orange fleshed Honeydews right now. They are coming to us from Full Belly Farm in Guinda, Ca. Orange Honeydews are easy to pick because they will give off a strong sweet smell when they are ripe. 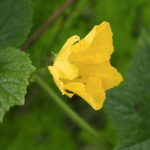 Green Honeydews are a little trickier. Look for a dull rind that looks more white than green. Also, rub a couple of fingers back and forth on the rind. If it feels sticky or tacky after doing this, then it’s ripe! With melons that have “netting” on the rind (see image below), always go in for a sniff. These types of melons will always have a sweet scent when ripe. Also, look for the background color. You want this to be yellow, not green. 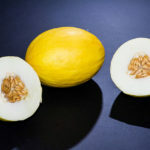 Other types of melons we carry with the netted rind are Galia, (bright yellow netted rind with a very sweet white-green flesh) and Goddess (white netted rind with super sweet orange flesh). These 2 types are a little softer in texture than a cantaloupe. Also known as the Santa Claus melon, these green, oval shaped melons should be a little soft to the touch, especially on the ends. Inside is a white flesh that tastes like mild green Honeydew. 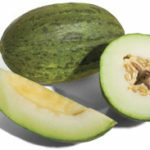 This melon has a sweet flavor and is slightly tangier than green Honeydew. The flesh resembles the white flesh of a pear. When ripe, the rind has a slight waxy feel. The name comes from its bright yellow color, which resembles that of the canary. Coming into the summer season, our produce departments receive new organic items almost every day. 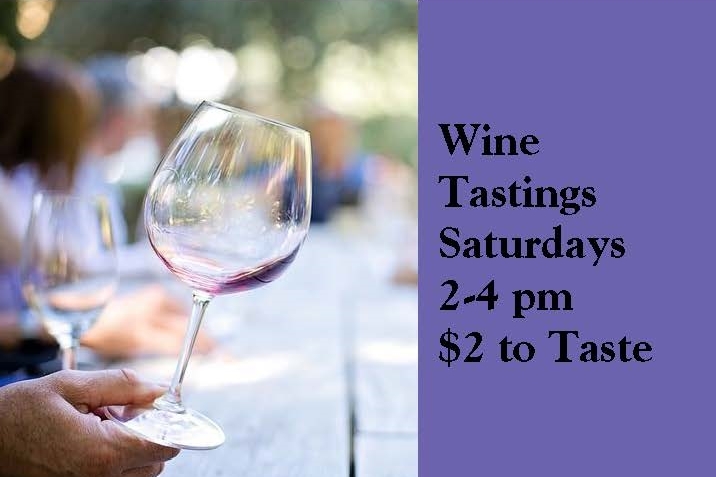 Come check out what’s in season and ask for a taste! Here are some of my favorites we have in stock at the moment. 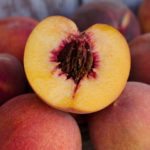 The Polar Light Nectarine from Valliwide Organic Farms is fragrant and sweet. These juicy white nectarines are best when they give off their strong floral scent, but are still sweet when eaten firm. We will have these available through the summer. 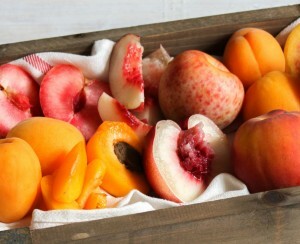 The Spring Crest Peach from Full Belly Farm is my favorite early season cling peach. This heirloom variety has a strong sweet-tart yellow flesh and super fuzzy golden skin. Great eaten out of hand, or sliced up and served with Straus Greek yogurt! Cot-N-Candy Apriums from Frog Hollow Farm are really a treat! These little jewels are about 2” in radius and have a very sweet, juicy flesh. Their skin is white with a bright pink blush. They are also free-stone, so you can gobble them up with no mess! Right now we have 4 different varieties of Cherries (Rainier, Lapin, Bing and Benton), with more to come later in the season. My favorite so far has been the Benton variety from Ferrari Farms located in Linden, CA. These cherries are plump and sweet with a dark, almost black flesh. I pitted and froze 3 lbs of these when they came in! The Black Knight Carrots from Full Belly Farm are gorgeous! Unlike other varieties of purple carrots that tend to be one solid color throughout, these tender roots have a deep purple skin with a creamy orange flesh. Try them sliced into coins on a salad or roasted with parsnips and rutabagas. The first California Cucumbers of the season are here! The Mediterranean Cucumbers from T.D.Willey farms are crisp and nutty in flavor. They have a thin skin and small seeds. No need to peel. I like them sliced up and drizzled with lime and Himalayan pink salt as a snack. Last but not least, the Red Lasoda potato from Full Belly Farms has to be my new favorite! This is one of many different varieties of new potatoes we have in stock at the moment. These young red potatoes have a skin so thin you can rub it off with your thumb. The semi-sweet flesh is pale yellow and has the smoothest, creamiest texture I have ever found in a potato! I like them cut in half and roasted with Burroughs Family Farms Olive Oil and fresh ground black pepper. Be sure to keep all new potatoes refrigerated until ready for use. We wait patiently every year for the Frog Hollow flat bed truck to pull into our driveway with stacks of perfectly ripe, organic apricots, peaches, plums, pluots and nectarines. Frog Hollow is a family run farm in Brentwood, California. Not only to they grow impeccable, tree-ripened produce, they also make amazing conserves (with low added sugar), tasty (and pure) olive oil and dried fruits. Swing by either market to buy their most seasonal fruits! Photos borrowed from the Frog Hollow website. Cocktail Grapefruits are not just for cocktails even tho’ they are virtuous in that regard! Their deep, super-saturated yellow tender flesh is amazingly buttery for a grapefruit—who would have thought a grapefruit could be so likable. Let Jimmy Cagney (film actor of the mid 20th Century) smash it in my face: I’m just gonna eat it. For the month of January these gems are on sale for $1.99/lb—IF supplies last! That brings up a sad anticipation: all these cold rains and frosts have “done a job” on satsuma mandarins in particular—it’ll be a short reason for them. Their rinds got waterlogged, swelled those tissues, and rot followed. Large swathes of carrot plantings got swept away in torrential floods; supply went to near nil, and prices shot up. Meanwhile, it’s still a good idea to cook (tender and ready for a puree) Gold Beets–then blend them seamlessly in with mashed Russet or Gold Potatoes. Yum. This also applies to Parsnips (you’d be surprised), Rutabagas (maybe even more surprised), or Turnips, especially the tender mild white “Tokyo” varietals. Or you can roast some Honeygold potatoes, along with any and all the roots aforementioned, in the pan under the rack which has the turkey and duck parts basting and savor-izing/umami-izing the roots & potatoes below. Don’t be afraid of that fat! For most people in those amounts with those vegetables, it’ll metabolize grandly, actually helping “burn” those potato carbs. Next day, you’ll wake up refreshed and energized, with the joyful ennui of a tasty meal’s memories curling the corners of your mouth. Health professionals loathe to tell you to take-up drinking wine, if you don’t already, but are happy to say that one-to-two glasses with such a meal, (studies continue to say), would be just swell for you and your moderate drinking guests. This author found Sierra Nevada Brewing Co’s “Celebration Ale”, to cut through the roast-pan gravied aspect of the above roots-meal suggestion, clearing the pallet for a fresh sensation of the next bite, its effervescence and vegetal hops dancing around the Parsnips, and oh, the Brussels Sprouts (forgot to mention those above). That beer will disappear soon, so experience it ASAP if you at all tolerate IPAs. Of course all the fresh fruits and vegetables we sell are certified organic. Some is also grown very close to here. In this neighborhood people seem to define “local” as “produced within 150 miles”. Other parts of the country use varying definitions, but we can keep it simple because we are blessed with some stellar growing regions within that radius. One of them features prominently in what we have to offer today, what we have to eat today. Watsonville and Santa Cruz (and thereabouts) are roughly 100 miles away. Lots of fine product coming from there right now. The farm that’s been delivering berries to us since spring (and has been for years) is JW Farms, a family operation in San Miguel Canyon in Watsonville. That they deliver to us directly (Tuesday, Thursday, and Saturday) has permitted us to have good prices on fresh strawberries all summer and into autumn. And lots of the nation’s best berries come out of Watsonville and Santa Cruz. There are modest-sized growers like Santa Cruz Berry Farms and large growers like Driscoll’s Strawberry Associates. You’ll see Watsonville-grown strawberries on the shelves of supermarkets in New York. But you’ll also see them here, about 100 miles from the fields. JW’s driver says it takes him about 2 hours to get here. Right now JW Farms is also our primary supplier of heirloom tomatoes. When you think of fresh tomatoes you probably think of summer. But autumn-harvested tomatoes ripen slowly. If they mature properly, they can have fine, rich flavor. Many years growers all over California produce excellent tomatoes up until Thanksgiving. This drought year, some growers have faded early. So we are fortunate that JW is doing probably their best work ever with heirloom tomatoes. When this season passes, when tomatoes are shipped from Mexico and from California greenhouses, you will not encounter flavors, colors, and textures to match what you can have on the table today. Prominent varieties in the heirloom mix include Black Brandywine and Pink Brandywine, both considered “sub-acid”, nearly all sweet; Marvel Stripe, variegated bright gold, red and orange, with a touch of tartness; and the surprising Persimmon, orange-colored, shaped like a Fuyu Persimmon, with gorgeous flavor and a texture that starts out firm and then just melts in your mouth. Enjoy, please. This is wonderful stuff. Before you knew you wanted only organic, you probably drank Martinelli’s Gold Medal apple juice. They make their juice from apples (mostly Pippin) grown in the Pajaro Valley. That’s Watsonville. Great apple growing country. Production volumes are such that by January we’ll have mostly Washington and Oregon apples. But first half of the apple-eating season we have plenty of local fruit. Lots more fine product from the region (many vegetables and mushrooms), but no more room to talk about it today. We’ll catch up in the next edition. Thank for reading. Eat. Enjoy. Lettuce is local, green beans are close, our all-organic produce nourishes you most. Nah, really shouldn’t try to rhyme in produce notes. Although rhythm is a powerful driver of what is great to eat on any given day. The turning of the Earth; the cycling of water from sea to sky to rain and snow to river flow; the birth of new plants and animals, their death and decay (composting, even) to nourish the next generations of plants and animals; the chill (we hope) of Winter, the green of Spring, the langourous heat of Summer, the collected weight of the year’s sunshine and rain hanging from trees and vines for Autumn harvest to store for our Winter sustenance. These rhythms, observed and understood by our forbearers, provide the pulse of our nourishment, the daily movement through the seasons of our food supply and the seasons of our lives. And now we’ve passed Memorial Day, the unofficial beginning of Summer. 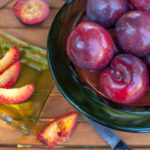 Now, today, while I’m writing this, we have some delightful, if surprising, early stone fruit. First pick Bing Cherries out of the Central Valley and the Sierra Foothills are disconcertingly sweet. I am accustomed to the first pick being only adequate, with flavor and sugar developing as the season progresses. But the two growers providing us Bings are shipping delicious fruit. 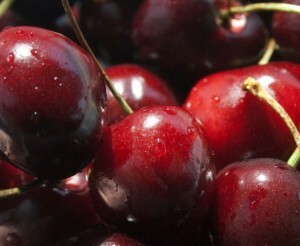 Another bit of surprise, Frog Hollow Farms is not one of those shippers of Bing Cherries. For the second consecutive year, chilling hours were insufficient to prepare the trees to set a good crop. Frog Hollow offered only Rainier Cherries this year. But one of the Bing’s pollinizers (cross-pollination companion variety), the yellow and red Rainier, produced nicely. Lots of nutrition to go with the deliciousness here. Sweet cherries are rich in anthocyanins and Vitamin A, provide a nice supply of dietary fiber, contain a broad spectrum of trace minerals, a nice little punch of potassium, B vitamins, and a nice little pop of melatonin for sweet sleep (though, admittedly, tart cherries have more). But, you may ask, why so expensive? According to the Washington State University College of Agricultural, Human and Natural Resource Sciences hand-labor accounts for roughly 60% of the production cost of fresh cherries. So realize that if the cherries are cheap, the workers’ labor was cheap. Last bit on cherries for now. Later in the summer (official summer) Washington cherries will be abundant. Projections are for a strong crop from Wenatchee and Chelan and Yakima, even from Prosser (home of the original Rainier tree). But if you want California fruit, local fruit from places you know like Gilroy and Sequoia Valley and Linden, get on them now. Real good today. When you talk about the breadth of varieties of stone fruit, you can’t help but talk about Modesto. In all the years I knew old college pal Eric the Animal (Modesto born and raised), other than beef I never saw him eat anything but fruit pie. Many of the most flavorful, productive and, dare I say it, interesting varieties available are the product of the tree fruit breeding program of a Modesto gentleman named Floyd Zaiger and his family. Like all good growers and breeders, the Zaigers are mighty hard workers. Each year they plant literally tens of thousands of seedlings in their quest for great varieties. 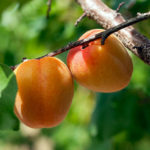 If you grow peaches, nectarines, apricots, plums, cherries and the like, you are looking for numerous qualities in fruit trees. Of course you want trees that will be healthy over the course of their lives. You want them to produce especially delicious fruit. But you’re not just growing fruit for fun or artistic expression. You’re trying to make a living. So you don’t want just one terrific variety to pick on July 2nd and take the rest of the summer off. You’d like an orchard full of varieties you can pick in succession, giving you fruit to sell all summer long. Our first really good yellow nectarine variety (and they’re almost gone, but I’ll tell you about them anyway, plenty more fine varieties to come) is the ZeeFire. If you see that “Zee” in the name on the display sign, that is certainly a variety bred by the Zaigers. The ZeeFire can be harvested in the Central Valley as early as mid-May. The texture is nicely dense, the flavor concentrated, the juice almost syrupy. So you don’t have to wait until July and August for good nectarines. The first good white nectarine variety is also a Zaiger-bred selection, Polar Light. Same qualities, dense, concentrated, syrupy, but white nectarines have very little acid, so no tartness, and a floral character not generally found in yellow nectarines. Good early nectarines, surprising, yes? More surprises? Next edition I’ll tell you a little more about “interspecifics”, but for now I’ll just say Aprium, a tasty apricot x plum cross, is not weird science, just good old-fashioned, pollen-brushed-on-stigma, grow the little tree, harvest a fruit, grow the seed, repeat a thousand times plant breeding. Ok, blueberries fast. We are in the flush time in California blueberry season. Growers have enough fruit that even little independent grocers with all-organic produce departments like us have access to big fat blueberries in big fat 18 oz packages. The eating quality is high, the nutrition places blues in the category of “Superfoods”, and at least three people I know (ok, I’m one of the three) are eating about a pint of them a day. Pancake special. The mangoes sliced onto this morning’s pancakes (and yes, of course all the ingredients were organic) were Hadens. 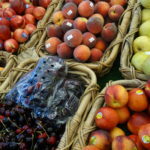 I picked ripe fruit off the display in El Cerrito yesterday, paid 99 cents apiece. Very flavorful, very reasonably priced. The raspberries were from JW Farms in Watsonville. Delivered to us directly by the grower, they cost me $2.99. Sweet, aromatic, nicely tender. Did we bother with syrup on the cakes? Nope. And what was the side dish on Pancake Saturday? Butter lettuce salad with fig vinaigrette. Salad is great breakfast fare if you just open your mind to it. Most of our lettuces at the Natural Grocery are coming from no further away than Salinas. We’re getting red and green butters from, amongst other, Blue Heron in Coralitos, Phil Foster Ranches in Hollister, J.E. Perry Farms in Fremont. Butter lettuces have succulent, tender leaves and sweet flavor. Excellent lettuces for breakfast. Really. They’ll be on special for the week of June 1st, $1.69 or $1.49, we’re not sure yet. And all the local lettuce growers in places with decent water supply are coming on, so probably more lettuces at good values to come. The figs on the salad? Ok, very expensive. The Brown Turkey figs come from Coachella, CA, 500 miles to the Southeast. Our fig season begins a month or so from now. In Coachella today, they’re picking fat, rich, sweet, glorious figs. Very pricey per pound, so I bought only two figs. One was sliced onto last night’s salad (which served 6 people), the other onto this morning’s salad (for 3). Such rich fruit that you can get a great deal of pleasure buying just one. You probably noticed that we had a shot of great sweet corn for a couple of weeks. That field is done now. Don’t know when the next grower will show up with corn. Corn is rather water-intensive, so it might be in sporadic supply this summer (we are in a capital D Drought, after all). If you like corn (and require it to be organic to be willing to eat it, as I certainly do, gracious, conventional corn is pretty much a nightmare), the next time you see it on display do not waste the opportunity. Regarding the green beans – availability is on the rise and the quality has been excellent. We’ve been getting beans mostly out of Fresno and Orange County and the price has been a sane and reasonable $2.99/lb. Very soon there will be fine green beans coming out of Santa Barbara and out of Brentwood. When I do the cooking, they get steamed for just 90 seconds. So last night our little one says “I don’t like this stuff on them. Why do put that on?” as she’s wiping the lemon-shallot dressing off a green bean with her cloth napkin. Admittedly the beans needed no adornment, they were awfully good. We’ll have to work on the napkin thing, though. Feed your families, feed your friends, nourish yourself, and for the generations who will till the soil we leave them, make it all organic.